Where To Taste the Best Whiskies and Scotches in Lyon? France is one of the world’s biggest markets for Scotch Whisky – not many people know that. But this must be why the Whisky tastings at La cave Ô papilles close to Place Guichard are so popular. Last week I went there for the second time. First we get to know each other and it turns out that many of the attendants are beginners. They have enjoyed Whisky for a long time and want to learn how to accurately distinguish the different tastes and smells. Others come here every month, they could talk for hours about one glass of the golden drink. All events are also open to non-members. „Everybody is going to experience the same Whisky in a different way“, says Thomas Favre. He leads the monthly soirées and deals professionally with Whisky: for instance, he is the Co-founder of Whiskyandco.net, an informational website for Whisky lovers. The theme of the evening is the independent bottler Van Wees and its brand Ultimate Whisky. „Independent“ means in this context that the beverage is not produced serially, like the supermarket brands that are supposed to always taste the same. Van Wees buys small amounts of casks directly from the distilleries – maybe just one cask – and blends and sells the result as limited product. There may only be two hundred bottles of one particular product, and when it’s gone, it’s gone. We all try the first Whisky. Some say it reminds of candy because it is a little sweet and lemony. Everybody finishes calmly his drink, adds water, smells and makes notes. We are handed a list of suggested adjectives to describe what we smell and taste – words like „wood “, „red fruit“ or „medicine“. Of course they are only suggestions: It is fundamental that we write down what comes to our minds on its own. The atmosphere is very friendly, but in many moments also very silent. Afterwards we discuss what we experienced. „Don’t let the others influence you“, says Thomas. „When I say I tasted Creme brûlée in the Whisky, you will instantly agree, even though you may not have tasted it before.“ The discussion round is sincere, not everybody liked this particular product. We taste the Whisky blind, we only get to see the bottle after the discussion round. The first example is from the Speyside in Northern Scotland, distilled by a small distillery named Balmenach, and 25 years old. 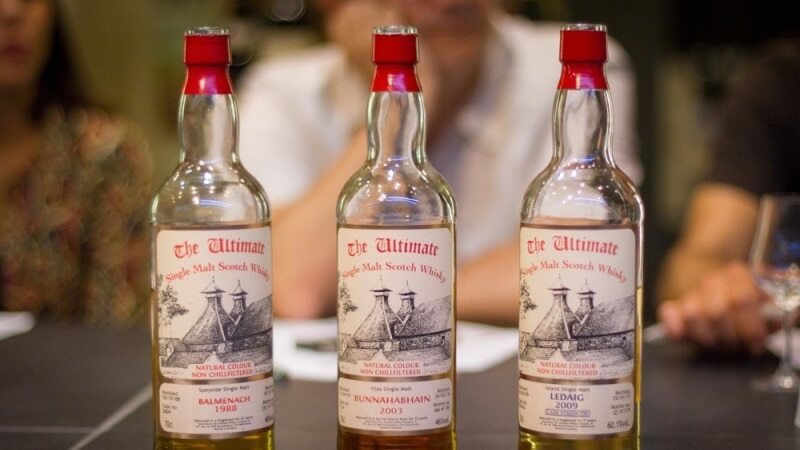 The bottles are numbered: This Single Malt exists in 322 bottles and we drink bottle no. 313. In the course of almost four hours we drink three different Whiskies: First, the afore-mentioned Balmenach. Then the beautyfully golden, 12 year old Bunnahabhain from Islay, matured in Sherry casks – this one was my favourite. And last the seven-year-old, cask strength (in this case: 60,1 percent alcohol) Ledaig from the Whisky region called Islands. 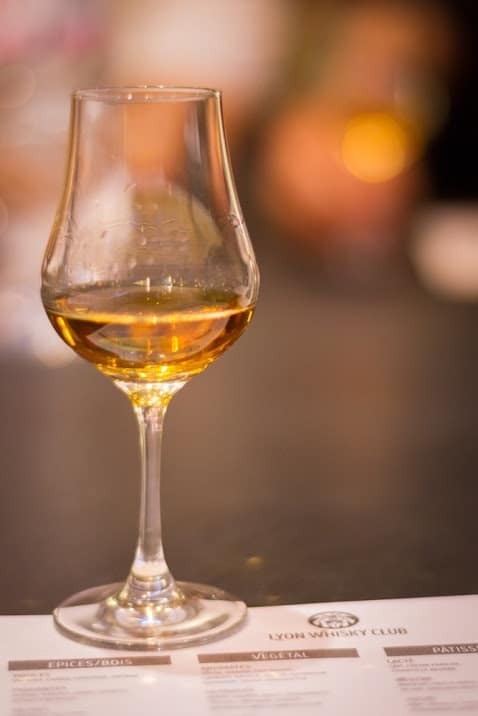 The evenings with the Lyon Whisky Club are special because it is rare to have an opportunity not only to taste Whiskies that are impossible to find on the market without good contacts and a whole lot of experience, but also because they are informational. The distinguished themes the soirées always have let us get to know the world of Whisky – the economics, the history, the politics – in a more educated way. You don’t just have a fine drink, you also learn about what exactly you are drinking, and the difference this makes is astonishing.